Cooking Christmas Dinner is pretty stressful anyway, but add meat eaters, vegetarians and picky eaters into the mix and you’ve got yourself the perfect recipe for angry parents, whiny kids and impatient older relatives. To make cooking the vegetarian options for Christmas dinner a bit easier this year, we’d recommend turning to your trusty iPhone to find some quick and simple recipes to take away some of the pressure. 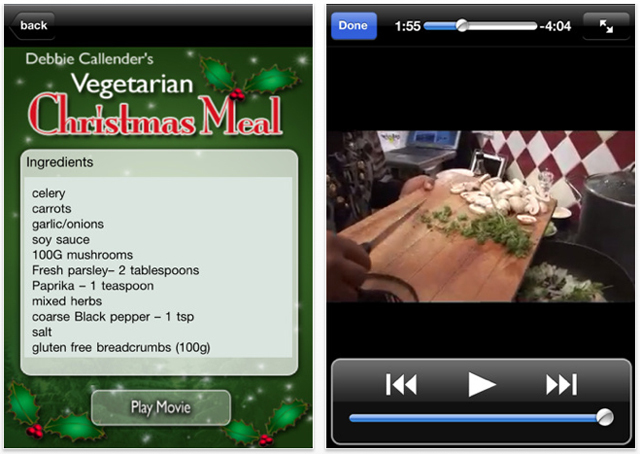 Debbie Callender (the woman behind other popular apps, like Fiver Food) has created a Christmas food app especially for veggies called Vegetarian Christmas Meal. The app gives you step-by-step instructions and how-to videos on how to cook a full veggie alternative, including tomato and fennel soup, lentil bake, red wine gravy and key lime cheesecake. The great thing about Vegetarian Christmas Meal is that all of the information is downloaded from the start, so you don’t need an internet connection all the time to be able to follow the recipes. It’s a shame the app only has one recipe for each course (it’d have been better to have some alternatives), but if you’re looking for some quick and easy veggie recipes this Christmas, then add this app to your collection. A little nearer to the big day we’ll be collecting together all of our favourite Christmas food recipe apps, so keep checking back! Available from iTunes for £0.69.